Another year, a few more hairs off my hairline, a few more pounds around my waist, another Air Jordan. Thirty two years is truly amazing. If you think about it, the original Air Jordan could be a lawyer or doctor by now for Pete’s sake! Thirty years separate these two (technically only thirteen since these are the 04 retro but you get the gist). How does the latest and greatest from Jordan Brand perform ? Best for: bigger guards to big men. If you like minimalist hoop shoes like the Kobe 8 or Mamba Instinct, you probably won’t like these. On the other foot, if you like older Lebrons you will probably like these. 16.5 ounces puts it in the Rose 7, 8, and CLB 16 weight class. Average mids are about 14.5 to 15 ounces for reference. Great traction especially on clean floors but not in the top tier across the spectrum of conditions. Definitely better than the translucent XXXI mid and low outsole. It sticks like glue on clean floors and slightly dusty floor but you still have to wipe dust off when dust is accumulates on the outsole. You can actually see the loose dust just sitting on these. Overall I’d put it in the Clutchfit drive bucket but with a better bite. Reminds me of the XX8 bite when clean but needs more wiping when dusty. Nike and JB must have a stash of Zoom they just save for certain shoes while they give everyone else the nickel size Zoom so they can slap a Zoom label on it. Unlocked Zoom in the forefoot and a nice big heel Zoom makes these feel like the Zoom of yesteryear…probably because they are the size of the Zoom from yesteryear. I do need to note that these ride fairly high, much higher than the XXXI because the forefoot Zoom is thicker. These sit almost as high as the Lebron 15. Not a big deal to me but it’s very noticeable comparatively. If low to the ground is your thing, these probably aren’t for you. True to size although a little tight to start. They are a tad long but I only had a little more than a finger width at the toe box which is my preference. If you have wide feet don’t pull on the laces around the midfoot to make the shoe feel comfortable. Also wear them a few hours and so the upper will stretch and break in nicely. I almost returned them just trying them but glad I didn’t after I broke them in. Aside from the upper, a lot of the magic happens at the ankle collar and back. These synthetic leather rands pull the ankle and foot back and keep them there. The Lows have them as well but they aren’t as long or wide. No heel slip or movement side to side, just a tighter and more refined fit than the XXXI. Great job JB! ﻿Nice Flyknit JB. Not a big deal for me but if you’re big into materials, you’ll enjoy these. Stretchy but tight where needed and conforms nicely to the foot. Just like wood grain or leather in a car, nice materials on a shoe make you feel like you didn’t spend extra money for nothing. Nice job JB! Hey look a shoe that actual feels supportive?! The way the XXXII pulls the ankle back along with the semi rigid heel counter feels very secure and safe. Think Hyperdunk 2016 lockdown and support but a little lower cut. It won’t affect your game but some players like more freedom. The carbon fiber shank for the midfoot is back. 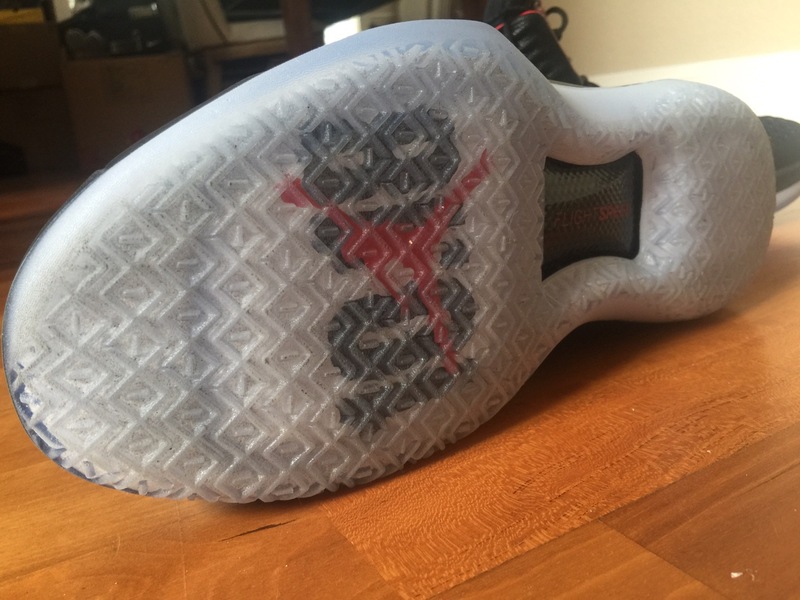 Mj had these on almost all his shoes after the XI for his plantar fasciitis so it’s nice that JB brought this back. Plastic would have worked too but carbon fiber just looks so much better and belongs on a premium sig shoe. I can’t tell how long it runs but feels really rigid and adds stiffness and torsional strength to shoe. However, it isn’t the only component of the XXXII that makes it start off stiff (more of that below). If you have plantar fasciitis or like to limit torsion, these are great. Stability is excellent on the XXXII thanks to forefoot outrigger and a fairly flat outsole around the heel. I thought I’d feel much more stable in the XXXII vs the XXXI due to the lack of protruding Zoom but after extensive time in both, the protrusion didn’t make a difference. I do think the XXXII feels more supportive and protective due to the stiffer heel counter and all the foam along the raised midsole (see below) as well as the carbon fiber shank. It feels a little overdone to me but hey, it works. The 32 does a great job with containment thanks to the raised midsole as well as the more tightly woven knit. This raised wall is thick and needs to be broken in to make the shoe feel natural. One of the thickest and tallest parts of the wall located next to the Jumpman is right where it flexes the most. You can see the huge wrinkles along the midsole that need to break in. If you want to accelerate the process play the 32 like an accordion. Seriously, it helps. If you don’t allow for break in, the shoe will want to keep straightening like a wooden plank. Jordan Brand did a nice job with the 32 as it does everything really well. There is literally nothing wrong with the AJ 32 except it needs some wiping on dusty floors and needs break in. But at the same time, there really isn’t anything that stands out to me and makes me want to keep wearing them. Maybe if I really enjoyed knit uppers? I will say the AJ XXXII is a safe shoe to buy meaning it should satisfy everyone except the minimalist hoop crowd that love shoes like the Kobe 8, Mamba Mentality, Instinct etc..It really plays like an an middle model LeBron which can be a good or bad thing depending on preference. At least Jordan Brand gave shoe tech geeks everything they asked for. And for those people who complain about the price, well get used to it that’s the way premium brands work. Adidas is charging $225 for some Ultra Boosts, UA charged $400 for a champ pack (and limited them, really smart idea UA when you’re losing market share). If you don’t want to pay $185 just wait, I did and scored them for $135 at a dicks sale. Eastbay is already letting you use coupons too. Expect these to fall within the $140 range and eventually $120-110 range. I’ll have to thoroughly explain brand equity one of these days to everyone. Will these make my top ten? Even though it does everything well, I’d have to say It just does everything well but to break my top ten today, I need that super special feeling, and aside from its looks and heritage, I just don’t get that from the XXXII… sorry I’m a romantic. And I know I’ll get his question, I’d take these over the Lebron 15, no questions asked (review coming soon). Hahha bc it’s true! I have quite a few shoes I just like looking at bc of the color blocking or silhouette so don’t feel bad. At least you got to make your own! Just wa quick update after a couple runs with these. Although I still think these shoes are pretty good,I threw my hd lows 2016 on the other night and started to appreciate those shoes more than I used to. The hds feel lower to the ground, more fluid, and MUCH better ventilated (I haven’t gotten blisters in the 32s yet, but it gets close near the end of my runs). Gonna give the 32s a few more runs and hope the midsole breaks in a little nicer to be less clunky. As always, very nice review. These look like a good overall shoe (both in performance and aesthetics) which is a nice comparison to the 31 mid. I really liked most aspects of the 31 mid but the poor traction on translucent outsole made the shoe unplayable for me. Based on your review of the 31 low – i might give those a go if I can get lucky and find them for a decent price. Can’t wait to read your thoughts on the Lebron 15. I was really pumped for that shoe but recently tried them on in store and was a little concerned about certain aspects (lateral movements in particular). I’m just a sucker for max zoom though. Keep up the great work and thanks for the follow on IG! I geeked out a little bit lol. Hhaha you got a nice collection don! Better than a lot I’ve seen. LeBron 15 sits way too high in my opinion and the upper is just a sock. Traction has been iffy too bleh. Cushioning is nice though ! It’s gonna be interesting with the next two Jordans if JB is gonna continue to updates to 30 year old shoes. I never liked the 2s, but the 32 is much better looking. same thing crossed my mind! maybe skip those i suppose. it might be a little too soon (10 years too soon) to think about a XI and XII ‘re-make’. but if JB skips a few models, we might get it sooner than we think. Thanks again for another great review. After trying on the mids and lows, I went with the lows because they felt less restrictive in the ankle.The zoom felt great and the knit upper felt nice out of the box. Traction and stability for me are way better than 31s. The midsole and ankle area are STIFF though. I played in and worked out in them for 2 weeks and they were very slow to break in. The clunkiness got better but never really went away after 2 wks. I stopped wearing them because I tweaked an ankle the stiffness made my ankle feel worse while I could play in my Hardens and CE lows without additional pain. Now my ankle feels much better and I don’t find myself reaching for them – I’d rather play in other shoes. I had high hopes for these and JB was very close. Maybe they’ll give us a a complete performance beast with the 33s. Sounds about right S. Really the only flexible part of the shoe is the forefoot while the rest is very rigid (similar to the dame 3). Solid shoe overall though after break in but like you said nothing I’d reach for. Curry 4 def feels cheap. 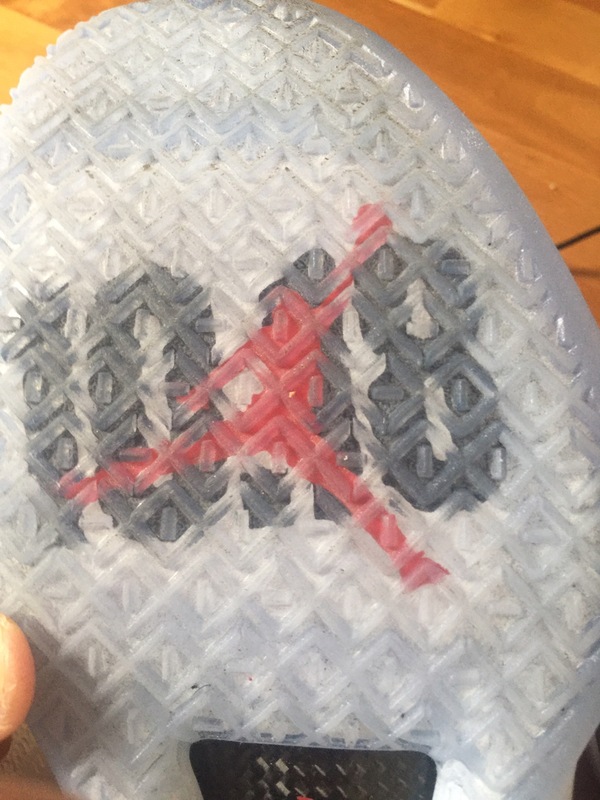 UA decided to drop the price but also the quality of materials and foam. Doubt it affects regular consumers or performance much but the feeling of value goes down . I see, someone has started a discussion about arch support. I would seriously consider these if the arch support is great like the Kobes. Although I love my KD9’s, having no arch support hurts when I play too long in them. Looking to swap them for another shoe with better cushioning. By the way the review mentioned that wide-footers shouldn’t pull the laces around the mid foot. Is the tightness anything like the KD9?I went true to size and the shoe ran long. with the laces, the mid foot region just hurt. So I just don’t wear any laces and its fine. wonder if the XXX2 feels the same way. By the way, just wanted to mention about the carbon fibre shank. It is no bigger than what we actually see. ( http://butologia.com/2017/09/technologie-wiwisekcja-air-jordan-32/ ). PS: nice review Schwollo. looking forward for the lebrons, though a bit sad to hear how the curry have regressed. It’s a different type of tightness but it it’s just spread across the entire foot. I don’t think you’d have the same kind of pain as the kd. Curry went bare bones . It should work fine on court (aside from the cushioning)but they cut some corners that the average consumer won’t care about. Thanks for the link guess the foam is just stiff as hell! How did you get these for 50 bucks off??? Dicks had a flash sale 40% one item fifty dollar max discount. Don’t worry Eastbay etc will allow coupons etc..
Great review schwo as always! 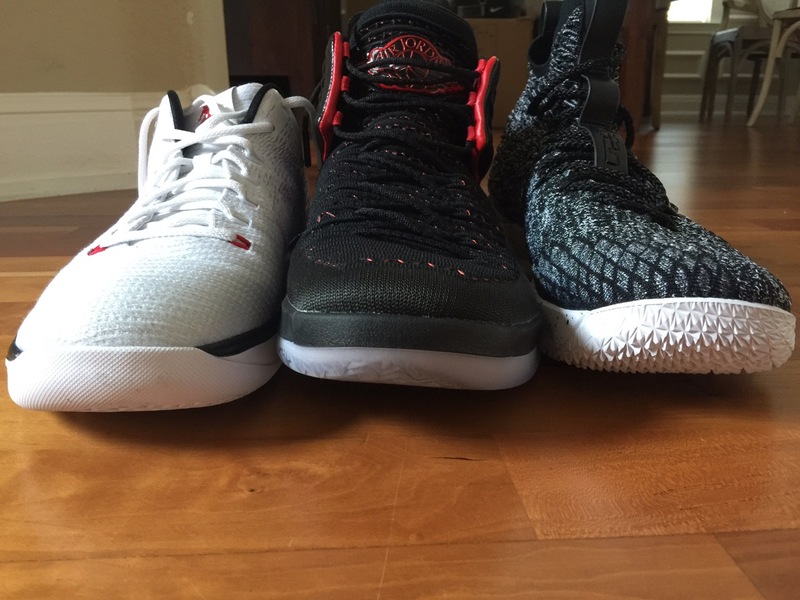 I ended up returning my LBJ15s for these 32s. 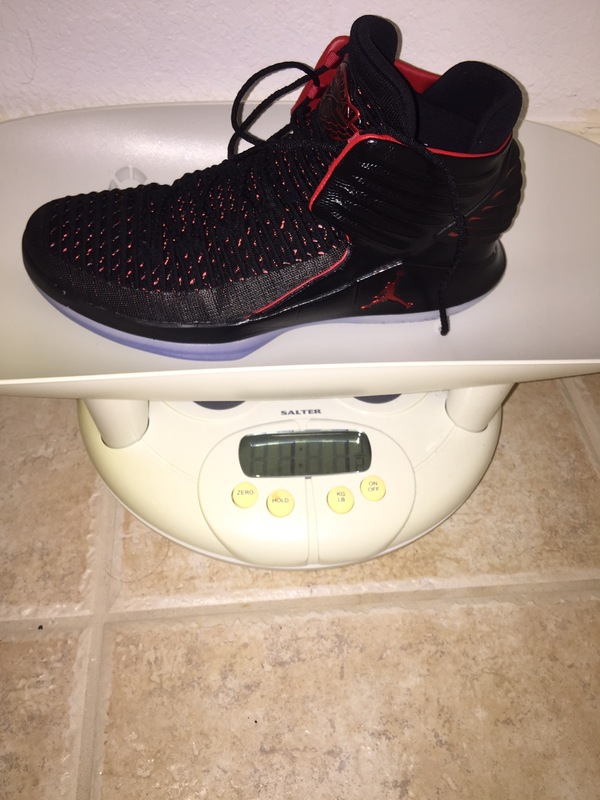 I got the LBJ15s in my true to size but it felt long and the battleknit wasn’t supportive enough for my weak ankles. Everything you mentioned above was pretty much on point for the 32s. I’d say the LBJ15s only beat the 32s from a cushion standpoint, but the 32s are superior in all other categories. Yep . That’s exactly how I feel about the lbj 15. Great cushioning nice fit but minimal support at such a tall height makes me worried. It is stable at the heel at least unlike the X.
I wanted to like these ’cause they sound good on paper (and, as you note, they check all the standard performance boxes) and look good aesthetically (although I haven’t been too keen on the blocking on the GR colorways). I guess it’s a good thing, though, if such an all-around solid performer doesn’t even make your top ten—means there are some real dope alternatives out there. Since these don’t make your rotation but the XXXI lows do, I’m curious about what gives them the edge. Is the solid rubber XXXI traction better than these? I’m assuming the XXXIs play a little more fluid/flexible, and you prefer that over the stiffer XXXII—is that accurate? Solid rubber outsole is about the same maybe slightly better in dusty floors but the flexibility of the shoe makes it feel much more natural plus I like the lower ride height..the 32 is a very good shoe I just like other shoes better that feel more natural. Gotcha. As usual, thank you for the info! Once again a very thorough performance review! Well done! Can’t wait though for Nike Hyper Fr34k! I got the Explosive Bounce’s shipping to me now and then you pull off a review like this! OMG which one do you like better and how can you do this to me! (32 low’s btw the mids don’t make me wet:-). Thnx brody! Haha I like the explosive bounce better . Feels more natural to me. Sits lower still well cushioned and better traction on dirty floors . Just ordered another pair actually since hit crazy sales prices . Dam I wish I could get a better deal on mine. I had to pay the full $100 off of a third party seller on Amazon because adidas(nor any other co.) make enough half sizes past sz.14. I know it cost at least a quarter milli for a co. For each size they make but dam I think they’re just being greedy and know big dudes have no choice but to size up to a 15 smh. 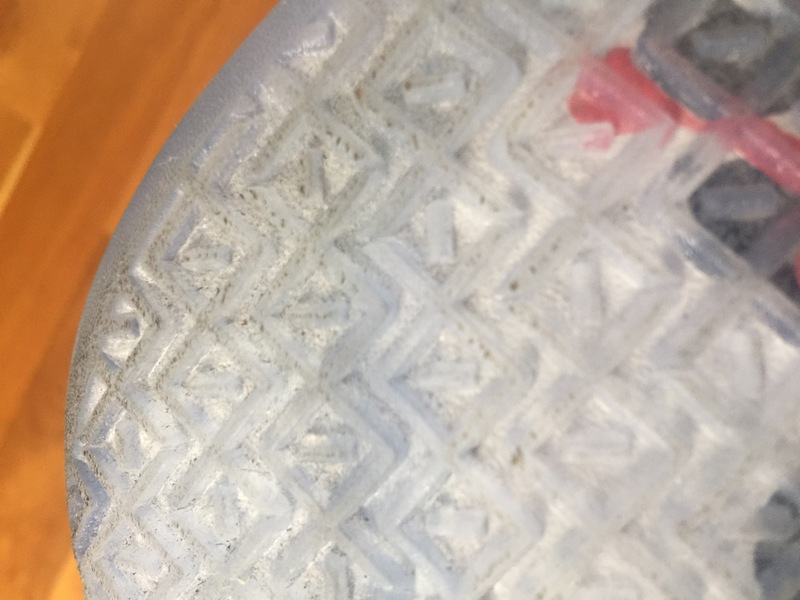 The only drawback with the explosive bounce for me is that lack of a good midfoot shank but are you gonna try a sol sof insole with a shank underneath it? Lmao, u got jokes bro but my pockets aren’t laughing lol. I hope your feet grow another 3 inches so you can my pain 🙂 Try going into a store and ask to try on a size 14+ and watch how perplexed their face looks! Schwollo when are you gonna do a review on the Lebron soldier 11? Coming in December . Finishing up Lebron xv and curry 4 this week. Man… my 32s low are stiff like a brick. I just played in them twice. Hopefully, they are getting more fluid soon (at least before I give up on them). Hey schwollo. I’ve been playing in a pair of jordan superfly 2s for the past few years and now am thinking about getting these. How does the zoom air in this shoe compare to the zoom air in the superfly 2s. The superfly forefoot Zoom is better feeling than the 32. Protrusions just make it feel more zoomy. Heel Zoom feels much better than superfly foam though. Thanks for the reply! Also, does the zoom in the superfly 2 feel similar to the zoom in the XX8s or XX9s? Closer to the xx9. Very close actually. great job, once again, keep it up !! I know you aren’t done with your soldier 11 review yet, but based off of what you’ve felt after playing in them so far, which shoe would be better for stability and zoom feel, the Jordan 32 or Soldier 11? thx for the response, im torn between getting the 32 low and the 31 low. Which one can you feel the cushion in more. I can feel it more in the 31 due to the protrusion. Size wise the 32 is probably thicker and needs some break in. it feels hurt in the medial side of my foot, where my arch is going down. Maybe I didn’t get the correct size. What do you think about the KD 9 Elite?? Elite is better than the regular 9 bc it runs truer to size than the regular. But a lot of people say that the KD 9 Elite feels more narrow but the flyknit is softer than the regular 9. Are they good for wide and flat foot? XX8 are more fun feeling with better traction but the 32 are a better performer overall. XX8 zoom zoom will probably pop too. While the stiffness is tolerable now and I appreciate the stability, the traction drives me nuts. It picks up dust in no time, and wiping with the hands does not clean the sole. After 30-45 mins the sole is covered in dust and there is no way to clean them in between baskets. This is driving me nuts! Anyone else having the same issues? Anyone found a fix? Do I keep playing until the outsole somehow magically breaks in aswell? Which colorway did you get? I don’t think it needs more break in. Maybe keep a moist towel nearby to step on . The Bred one. Cleaned it really well today and it was ok. Thinking about using a light sandpaper. Any thoughts/experience? were this shoe as stiff as the lebron ix and ix elites? Of the 32 is stiffer than the Lebron midsole but the upper of the Lebron is stiffer than the 32. 32 Starts out stiffer and breaks in but still doesn’t feel super fluid postbreak in to me. Hi Schwollo, thanks for the review. Is this shoe the same as the “Air Jordan Super.Fly 2017”? If not, how does it differ and have you done an independent review on that one? No the super fly 17 is a different shoe. I have not done a review on it. Sorry ! 31 had better ventilation, better Zoom (by far! ), better materials in the heel/Achilles area and better internal materials (the six pads, lining materials, etc). 32 has better traction (but not *that* much better), better fit (more adaptive, they were both cut strangely with one being wider/shorter and the only being longer/narrower), arguably better support (in some areas, in others no). It is more stable but again not *that* stable. It reminds me of a wobblier, slightly cushier Curry 2. Stiff shoe with a high stack height, though you can feel the Zoom after break in more than I could feel the Charged Foam (though the Curry 2 has amazing traction and better court feel, so there’s that). The step-in comfort was better on the 31. The long-term upper comfort is better on the 32, 31 had a sloppy fit in some areas, 32 is pretty money all the way around. How is it that the 31 was both cushier AND lower-profile? It boggles the mind. To me they are both very close in terms of performance. For a straight ahead player, get the 31. If you were one of these people who loved the comfort, cushioning, ankle support, breathability and other pluses of the 31 but HATED the outsole/construction (for its slippery/wobbly properties), then get the 32 as they addressed those issues pretty effectively. Nice review ! I agree with most everything except the Curry 2 part but I see where you got that feeling. could you gow half size up with these (32)? you think it would make some difference for wide feet? because they are little long? Not really you get used to it. How do these compared with the Crazy Light Boost 2016/2018 ? Especially cushioning and ride height? Both just as clunky ?